We are part of a book club that we started with our friends sometime last year. Since beginning this blog we have wanted to share our picks and thoughts with you. We’d love for you to follow us through our book club readings! Read along (we aim to do one book a month) and share your opinions with us in the comments! A bunch of seventeen-year-olds (joking but not really) form an offbeat crew to go on a suicide mission for a ton of cash (and bragging rights). This book is part of a duology, with the second book entitled the Crooked Kingdom, that takes places in the Grisha universe (also penned by Bardugo). I honestly didn’t like the book at first and it was really hard for me to get into. I think the first chapter or “prologue” didn’t interest me at all. It wasn’t until I was reading about the main characters that I was intrigued. My favourite character was Inej, her chapters were always my favourite. She’s a character with a lot of complexity – there is her religious beliefs, her unique background and personal tragedies, mixed in with her current life and the fact that she probably has the worst taste in men (here’s looking at you, Kaz). I also like her because even though she isn’t a Grisha (a person born with mystical abilities), she is extraordinary in her own way. She is quiet, graceful, an acrobat and a secret stealer. She’s on the cusp of being dangerous, and growing into that personality trait with her is a rush. The world-building itself is also interesting. Apparently, this is the second set of books taking place in the author’s universe. The first being the Shadow and Bone series, which explains what Grisha are, and the extent of their powers in more detail. It’s not necessary to read this book series beforehand, and Six of Crows received better reviews as well. 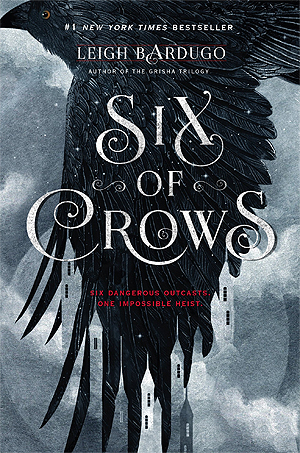 I think in the future I would read this series just to get more information about the world because the author mentions so many different places and cultures but doesn’t have a chance to delve deep in Six of Crows. At first, I was slow to like the characters but ending up falling quite hard for them all halfway through. Like Alia, I enjoyed learning about their back stories and reading from their different perspectives. Hands down, Nina is the best character! She’s a high level Heartrender (see: magic user) that loves cookies. I feel like Inej and Nina are basically Alia & me when we play D&D. I loved the diversity amongst the crew as well. Women, POCs, and even disability is represented amongst the protagonists! Although I sometimes wish that Kaz was a bit older since he’s almost too badass … but we’ll look past that I guess. I finished this book pretty quickly and immediately read Crooked Kingdom right after, which I 10/10 would recommend. I actually enjoyed the sequel much better! The under belly of Bardugo’s world itself is pretty cool and I like the magic system. Perhaps I’ll pick up the other books in the Grisha series one day. Who had the most interesting backstory? If you could be a Grisha, what power would you want? Were you surprised by anything in the story? If you were to read another story set in the same universe, what would you like to see/learn more of? You can follow us on goodreads here and here. And you can pick up a copy here.